Fabish the Horse that Braved a Bushfire is an outstanding picture book. It is a true, mysterious, intriguing and emotional story of an ex-racing horse which took seven yearlings under his wing during ‘The Black Saturday’ bushfires that swept through Victoria during 2009. Nobody knows where Fabish went to escape the fire, but he returned home with the other horses the following day – every one of them completely unscathed. Neridah McMullin has horses in her heritage and totally fell in love with Fabish when she heard his story. She described him as intelligent but also as having warmth not always associated with race horses. The words she uses in her story are heartfelt and compassionate, but strong too – as strong as Fabish, as strong as those that live on the land and deal with the harshness of bushfires. There is something else I admire about Neridah’s writing: the way she incorporates ‘horse’ and ‘fire’ associated words into her story. She incorporates words not typical in everyday language but does not shy away from using them, simplifying them, nor does she explain them. An example of words used are: clods, yearlings, pranced, flighty, tack, whinnied, and billowing, embers, ablaze, doused, charred, desolate. Children learn words from context, and often it is through the words in picture books that they first encounter and work out the meanings of words – sometimes on their own, through implied meaning, sometimes through discussion with adult story readers. There is a lot to talk about with this book. The words and story come alive, too, with the illustrations of gifted Andrew McLean. He has used a combination of watercolour paintings and sketches. Although he has stated that this is the first time that he had to draw and paint horses, you get a real sense of the emotional and personality traits of Fabish and all the horses throughout the story. The colour palettes he uses make every page come alive so that you feel totally immersed in the world he creates. I would recommend this book for readers 6+ years as a maturity level is needed to comprehend the complexities of the story. 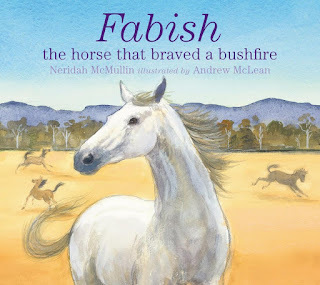 The book evokes the need to re-read again and again, and also, to tell everyone you know how amazing this story about Fabish the very brave horse is. Brook Tayla writes a blog called telltalestome@wordpress.com and would love you to drop by, read some reviews, leave a comment, and subscribe.